Chuck Cooper, Director of Design & Construction, draws a distinction between innovation and improvement. At DaVita Healthcare Partners, the word CEO is swapped for Mayor, employees are called teammates, and DaVita (an Italian word for “he or she gives life”) is referred to as a village, not a company. 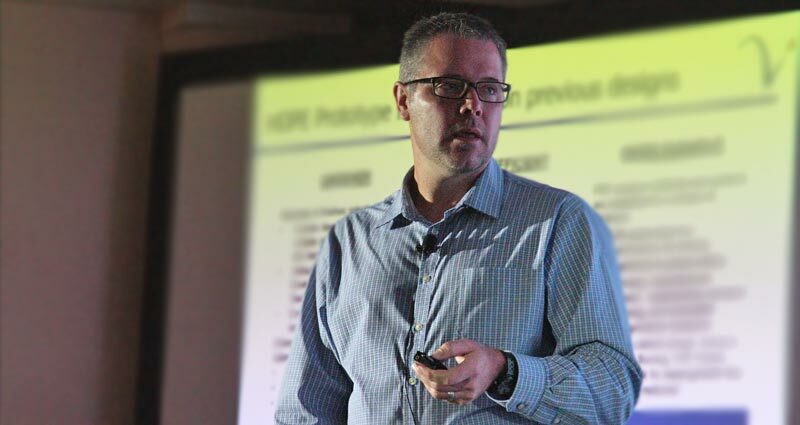 Chuck Cooper, DaVita’s Director of Design & Construction, gave a talk at the Health Facilities Innovation Forum that provided a fascinating glimpse into the unique corporate culture and ongoing clinic innovation at DaVita. Right off the bat, Cooper draws a distinction between innovation and improvement. Dialysis isn’t exactly the highlight of anyone’s week. But the team at DaVita recognizes design as a hugely significant influence on patient experience and launched the HOPE Prototype in 2014 to ditch the institutional look and embrace the most warm, welcoming feel possible. Welcome (Waiting/Reception): Invites patients into space, identifies DaVita brand. Avenue (Patient preparation): Psychological transition before treatment. Hub (Nurse/Med Prep/Lab): Threshold between treatment and business functions. Works (R.O. Biocarb/Storage access): Direct access for periodic monitoring and testing. Thermal comfort, TV, and comfy chairs are also key to making patients who come in three days a week and are sedentary for hours at a time feel more at home. Small yet significant design tweaks further enhance the patient experience, like turning the patients to face the window and able to enjoy nature and light, and pulling HVAC zones into separated areas and diffusing lightly over the patients so the air isn’t directly blowing on them. To fully express the DaVita vision, the 194-page HOPE Design Guide serves as a playbook for the scattered architecture and engineering firms they work with across the country. Instead of simply giving partners a set of technical drawings, the guide helps them bring new talent in with an understanding of how DaVita works, thinks, and treats patients. As one of the largest kidney care companies in the U.S. with about 2,318 outpatient centers, DaVita’s portfolio is nothing short of massive. Add to that the 22 vendors that handle DaVita’s built materials, and you may find yourself scratching your head at how they balance continuous innovation with standardization. Cue their national Furnish By Owner program. Since 2014, the FBO program has established large vendor relationship contracts integral to building sustainable new clinics by specifying greener, more durable materials, finishes, and equipment. Materials standardization is achieved at discounted (national) pricing through the program. Clinic flow and functionality is vetted by 50+ stakeholders across the village for enhanced operational value. All FBO program materials and systems, from chase cabinet design to resilient flooring, are based on life-cycle cost, safety, warranty, manufacturer support, replacement, product sourcing and embodied carbon footprint. In addition, as a former regional chairman of the USGBC, Cooper is well-versed in market transformation. Speed to market (convenience quickly):- Standardization to reduce design/build times. - Consistent use of vendors to remove inventory issues and gain volume purchase discounts. - Healthier materials & finishes. - Enhanced patient and teammate experience achieved through aesthetics, daylighting & color psychology. - Decrease total cost of occupancy. 22 FBO materials/equipment selected for life-cycle cost, TM and patient safety, and warranty. BMS systems reduce energy consumption by 7%. Risk for mold growth has been reduced with new chase cabinet design, resinous and resilient flooring and RFP panels. Similar to the HOPE Design Guide, another guidebook exists for the shell building prototypes, which make up 20-25% of the sites, as well as the TI prototype. He also shared lessons learned from previous prototypes. Cooper found that giving the team too many options and designs watered down the brand, so the decision was made to condense to one solid look and feel. Because the ultimate goals are to be greener, more durable and efficient, design choices aren’t a first-cost discussion but based on ROI and life cycle. He references the decision to use BAS and envelope design, as well as LED light bulbs, which won’t need to be changed for 10 years (and reduced lighting by 33%). To embody their core principle of continuous improvement, DaVita’s PEAK team embraces LEAN principles to constantly cut waste and enhance their process. “We work on a lot of different diagrams analyzing the flow for our layouts, not just the constructability but really how many steps does it take for patients, staff, etc.,” said Cooper. Another design element DaVita embraces is color psychology, as Cooper admits the previous prototypes used corporate colors that didn’t enhance the patient experience. Now, orange is featured in their “Refresh” area, like the teammate lounge, to stimulate social interaction and energy. In areas zoned as “Task” where productivity and trust is key, blue is used, while “Living” areas promote healing and relaxation with shades of green. To translate ideas into real improvements, DaVita uses the Idea Form on Eureka!, an innovation platform where all teammates are able to log on and submit ideas. Once a month, the Innovation in Design Committee gathers--the last meeting had 76 callers from all over the country--to brainstorm and discuss submitted ideas. The pilot to program process works perfectly for DaVita, who will pilot one clinic or region to see results on ROI and cost before launching national innovations. One successful idea born from the IDC was the “regional wall,” which is now a signature DaVita addition. With the goal to cultivate relationships and bring a sense of community into each clinic, locally sourced materials obtained through sustainable methods are used to create a wall representing the culture of each region. Materials must be sourced within 100 miles, harvested responsibly (FSC certified,reclaimed, recycled), and non-toxic. 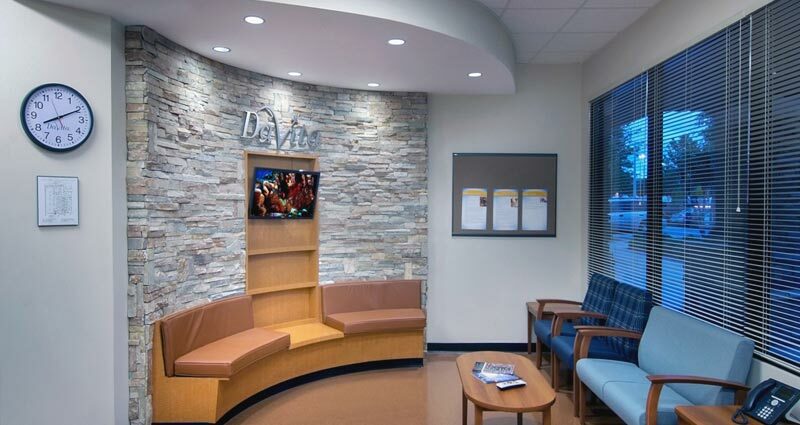 From a stone wall in Rockville, Maryland, petroglyphs on concrete in Nevada, and reclaimed barnwood in Oklahoma, the regional wall has contributed to the “at home” feel of DaVita clinics. A regional wall at a DaVita center in Georgia. Modular construction: DaVita is starting to explore digital fabrication, and is currently evaluating companies like and Blox and DIRTT. They are researching the possibility of modular exam rooms for dialysis, home care and larger facilities. IoT: 11 IoT technologies were researched to find potential facilities savings opportunities, and 3 technologies were ultimately identified for a total savings of $7 million. DaVita is rolling out lighting control, automated pressure sensors, and leak detection in water chases, where strip sensors are placed under plumbing in chase boxes to allow quick discovery of leaks. The sensors records when and where leaks take place thanks to a central BMS, which notifies biomed managers are notified by text/email when differential pressure is greater than 15 PSI. They also monitor medicine fridges with IoT, plugging them into the grid to see if temps drop overnight. Sustainability: DaVita is working with their Village Green team on enhanced sustainability, after achieving 7 of 8 “green” goals for 2015. They are aiming to further raise their environmental consciousness by creating their own rating system. Borrowing from programs like LEED and Energy Star, DaVita is tailoring a model to fit their needs. Continuous Education: Unique opportunities for leadership and development are a priority at DaVita, such as tuition, license renewal and recertification reimbursement. DaVita Academy is a two-day event introducing new team members to the culture, and DaVita University offers live events every year for teammates to grow.